It is easier to catch a thief if you know him. Or her. Therein lies the seed of an idea that has captured human imagination for centuries and, along the way, beguiled millions with iconic fictional characters and their equally iconic sidekicks. There is something about the fingerprint. A hundred questions spring up and yet not one is countered on the double. Human mind being what it is – incurably curious, a profile soon begins to take shape. Whose fingerprint is it – burglar or relative, man or woman, young or old, blue- or white-collared? The art of profiling possibly began with bemused neanderthals staring at a cave painting, wondering who among them possessed the artistic streak in addition to a human spouse. The chants of a hymn, the metre of a poem, the strains of a musical composition – they tickle unbound curiosity within us; profiling is but the next logical step. It is the same with prose. The use of a language, the rhythm of the sentences, the distinctiveness of their construction – one can tell a great deal about the writer by reading him or her. Indeed, one of the world’s most-wanted terrorists, the Unabomber, was caught simply by analysing how – not what – he wrote. But fingerprints at first glance tell us little. Or so we thought. In 2015, two Indian scientists, Jasmine Kaur Dhall and Anup Kumar Kapoor, made an astonishing advance in criminal anthropology. Just by studying the ridge density of a fingerprint, the scientists claimed they could, with an accuracy of up to 98 per cent, identify whether it belonged to a man or a woman. Their discovery holds great promise for investigators and criminologists alike. Rather fitting, too, that two Indians have advanced the field of forensic science, for 120 years before Dhall and Kapoor, two other Indians had not just advanced the field of forensic science but given birth to it. This is their story, the story of those two Indians. It is a story of triumph and tragedy, of remembered villains and forgotten heroes, of conquering nations and of nations conquered, and like most such stories, it begins with war. It is the summer of 1853. The battle between the great empires of the world has just begun in the Crimea. Meanwhile, away from the blood-soaked arena where a million men would soon lose their lives, large crowds have gathered at Boribunder in Bombay to view an unearthly spectacle. Many are carrying offerings of coconuts for the demon or god shortly to emerge from this miraculous contraption that doesn’t need bullocks or horses to be pulled along. It runs on fire and steam. They are calling it the aag gadi. Fourteen carriages full of white men and women are readying themselves for the lavish banquet that awaits them at Thane to commemorate the aag gadi’s maiden run. The railways have arrived. The London Illustrated News reports it as a victory greater than that of Plassey, Assaye and Gujarat. Who would have thought that amid this frenzy and euphoria, Mangal Pandey’s doomed war cry was just four years away? Certainly not the men and women of the Company. It is the time to explore, to cash in, and to open the floodgates for the sons and daughters of the mother country. One such son, William James Herschel, has just landed on Indian shores along with his steel trunk. He is joining the Bengal Presidency cadre of the Company as a writer, having graduated from the East India College at Haileybury. Like any other graduate of this Indian Writership Programme, he carries with him an air of high worth and moral superiority. After all, he is going to be a cog in the wheel of the world’s greatest corporation, ridiculously well-compensated too, compared to an equivalent position back home. The further you are from the beating heart of the empire, the more blood it pumps at you. Civilising the savages presumably requires adequate TA/DA. Cushioned in all the worldly comforts colonial India has on offer – comforts a young Englishman can only dream of back home amid crushing poverty, class wars, and cholera outbreaks – William Herschel takes to India like duck to water. Bengal becomes his only home. It is now the summer of 1858. The Russian Empire has lost the Crimean war. Mangal Pandey has lost his life. And, no longer a fresh-off-the-boat sahib, young William has lost his sense of purpose. He is depressed. Indigo has robbed Bengal’s soil of its vitality and the Bengalis of their dignity. Riding on Europe’s enchantment with the blue dye, the East India Company has quietly been fuelling a formidable plantation economy in Lower Bengal. As indigo becomes the Company’s top export item (next only to opium), indigo farmers, or ryots, are sucked into a downward spiral of poverty and hunger. Cultivating indigo over rice has raised the production cost by an exorbitant Rs 7 per bigha. It is daylight robbery, and ryots and zamindars alike are having to choose between death through either starvation or debt. Resistance means getting on the wrong side of the well-built lathiyals of the Planter sahibs; it means braving a leathered Shamchand or a bladed Ramkant. It was not always this bad. Just a year ago, Mangal Pandey’s bravado in Barrackpore had sparked a flicker of hope. Could the revolt, gathering speed as it relayed along the Ganga from Bengal to several north-western provinces, end years of misery and oppression? Truth be told, the sudden uprising had jolted the British; they just didn’t see it coming. Natives were supposed to be tanned automatons that worked only when keyed. Why were we not told otherwise – did someone forget to update the Great British Hindoostan Manual? The payback was savage. Lucknow, Kanpur, Delhi, Jhansi, Bengal, Arrah – one by one they fell to the bloodthirsty British. The Company enforced Act XIV, empowering officers to pass a death sentence “on the spot” for sedition. Villages were torched at will across the length and breadth of the country, to thwart the slightest chance of retaliation. New torture methods were devised, ones that would have made the Spanish blush. One Major Renaud took great joy in blackening with tar the face of any brown civilian spotted in his contingent’s line of march, and hanging him by the nearest tree. Facing the justice of a certain Brigadier Neil meant watching your skin being sown to a pig’s while you, and the pig, shrieked in unbearable agony. Delhi bore the brunt of British savagery. Thousands were hanged; even church gardens weren’t spared. Bahadur Shah Zafar’s 16 sons were hunted down mercilessly; most were stripped to the bone, then hanged in public. “In 24 hours, I disposed of the principal members of the house of Timur the Tartar. I am not cruel, but I confess I did enjoy the opportunity of ridding the earth of these wretches,” wrote one Captain William Hodson to his sister. The emperor himself was put in a cage “like a beast” and exhibited. The Government of India Charter was rolled out. The Company and its Governor General, Charles Canning, were brought under the aegis of Queen Victoria. The college at Haileybury was closed. As a reconciliatory gesture, a few of its alumni, the erstwhile writers and assistants, were nominated to join the Indian Civil Service (ICS) tasked now with implementing reforms for a new India. One among them was handed charge of the Jungipoor subdivision on the upper reaches of the Hooghly. His name was William James Herschel. Having lived and worked for five years in the interiors of Bengal, one would think Herschel is well equipped to hit the ground running. In reality, getting anything done is proving to be well nigh impossible in post-mutiny Bengal. Embittered and scarred, Indians no longer hold any trust or loyalty for the British. To make matters more difficult for the sahibs, small business owners, suppliers, and peasants, witness to rampant corruption and plundering in the Company era, have picked up the tricks as well as the gumption to indulge in forgery and non-compliance. In this sinister climate, Herschel is facing the worst time of his life, not being able to achieve anything worthwhile in his new, high-profile posting. Born in a family of illustrious astronomers, and named after his grandfather William Herschel, the discoverer of Uranus, he must have cursed the day he heeded to his father’s counsel – to go for a lonely, isolated life, and work long hours in the sweltering Indian heat to make a career in administration over astronomy. India is proving to be much more arduous to discover than a complete planet for the young Herschel. In one such moment of self-doubt and misery, he pours out his frustration in a letter to one of his Haileybury companions. The 25-year-old confides in his friend, of the treacherous circumstances that have more or less hurtled him towards a failed career, of why he does not expect any good to come out of the orders he is signing every waking day. Rent-rolls from the planters, pothas issued by the zamindars to each ryot, kabooliyats from the ryots – all are mere pieces of paper. Administration of civil justice is a nightmare in a setting rampant with fraud and con jobs. It is a letter as close to being a suicide note without being one, an unmistakable offering of a wrist to be pulled from the ledge he is pacing to and fro on. The friend’s reply must have acted like a balm to young Herschel’s senses, for very soon he experiences a eureka moment that will bring him world fame. One fateful July day in 1858, after labouring through tender applications that have arrived from the local ghooting suppliers for the Jungipoor road-metalling project, Herschel selects the proposal of one Rajyadhar Konai of Nista village. Preparing the supplier contract for Konai, Herschel vaguely recalls Thomas Bewick, an author he has admired since childhood. Bewick, a naturalist, would leave his thumb marks as vignettes in his books. Herschel talks Konai into sealing the terms of contract with his handprint, smeared earlier with a homemade ink-oil solution. It comforts him to know that Konai could now be identified and held accountable, should any dissatisfaction on account of the quality of his material and work arise. Excited about this newfound means of levying compliance, he gives it a try with his own hand, soon concluding that fingerprints are more than sufficient as a guarantee against forged signatures and plausible denials. The age of unique personal identification had arrived. Things are going well for both Konai and Herschel. Konai has become a trusted contractor in Jungipoor, and Herschel has regained his lost confidence. At their occasional meetings, for project review or contract renewal, Herschel self-effacingly researches the mounds and the ridges of Konai’s hand, believing he is making pioneering advances in a field that didn’t exist before. Little does he know. Konai, initially, is puzzled with Herschel’s excessive enthusiasm for studying palm patterns. After all, the temple priests and the village palmists have been doing so for generations – to foresee risks, riches, relationships, profession, health, death, and more, by applying the principles of a treatise Herschel would never even have heard of. To be sure, much of it has been common knowledge for millions like Konai. One needn’t, for example, be a shastri to know of the ancient Indian belief that the one born with chakras or concentric whorls on his fingers and foot soles is likely to be a king, blessed with prosperity, intellect, and power. For Herschel, such talk is absurd. So when Konai broaches palmistry, Herschel laughs it off. Sometimes, to step out of hubris and into humility is as difficult a task as making the discovery itself. Had Herschel cared, he would have become famous for being the first man in modern history to test and re-designate fingerprints as a biometric. Had he researched more, looked deeper into what he thought was his original breakthrough, he would have stumbled upon Samudra Shastra, the ancient Vedic text that separates fingerprints into discrete categories through close visual inspection. If not the Samudra Shastra, a similar concept published in 1823 by the Czech physiologist Purkinjey would have been a reference easier to tap for a European, and raised the analytical import of Herschel’s work by several notches. Alas. Fate stares, fame blinks. To Herschel’s immense credit, though, he sets out to compile an extensive, date-stamped record of fingerprints during his subsequent postings at Arrah, Hooghly, Midnapore, and the focal of the Nilbidroh, Nadia. No field visit is futile, no visitor is spared. Supervisors, colleagues, guests, contractors, peasants, tourists, even the Maharaja of Nadia – they are all added to the meticulous database. What’s more, Herschel even remembers to collect repeat fingerprints of the same person so as to assess the degree of alteration with age. Next, to evaluate the robustness of a fingerprint against forged impersonation, he commissions the best artists in Calcutta to create copies of anonymous fingerprint samples of professional criminals. To Herschel’s relief, the imitation drawings are a flop. Delighted, he introduces this signature method in several registration offices and jails within districts that come under his direct control. Not through an official government order but, rather, by their sahib’s hikmat that his eagerness to impress office clerks set in motion Herschel’s plan. It is a resounding success. Forgery rates witness a sharp decline. Herschel is overjoyed, but he wants more. The message is spreading but not fame. This confounds him. After all, he sees himself as the discoverer of using fingerprints as unique signatures; only a matter of time before his name is taken in the same breath as Charles Babbage and Rowland Hill. And this is where the cookie crumbles. William James Herschel soon learns that hand and fingerprints were being used as signatures for centuries in China and India. That is how those who were illiterate would sign, and that is how the Mughal kings would add weight to the strategic or diplomatic importance of a farmaan. It is a body blow. Years of work all gone to waste. No one remembers the one who was second, but here, because the technique was so routine, no one even remembers the one who was first. Clutching at straws, Herschel rewires his hubris. He begins to believe that if not for him, at least Europe would have remained oblivious to the discovery, that not only has he identified the potential of an untapped idea, he has also implemented a proof of concept backed with a meticulously detailed and extensive database for the Western world to be in awe of. Sadly, and much to Herschel’s chagrin, he again finds himself not alone in his fascination with fingerprints. In October of 1880, Herschel comes across a note by British scientist Henry Faulds in the journal Nature. Through his studies in Japan, Faulds has proposed fingerprints as a means to identify suspects in criminal investigations. Alarmed, and worried he may have missed his moment of glory, Herschel decides to act. He dispatches a letter to the same journal describing his work and observations from India. Nature carries his letter in its November 1880 edition. Figure 4: Herschel’s Letter to the journal Nature. The choice before Faulds and Herschel is now clear – fruitful collaboration or bitter rivalry. Sadly, it turns into the latter. Both claim the right of being recognised as the first to discover the usefulness of fingerprinting. While Faulds takes his idea to the Scotland Yard in 1886, Herschel writes to the Secretary of the Government of Bengal, requesting a nomination for being recognised for the discovery of “a powerful instrument for the security of the society, the general use of which would be a substantial contribution towards public morality.” The battle lines are drawn, and this time around, the English are fighting the English. Scotland Yard fails to see merit in Faulds’ idea, but a contemporary English writer who goes by the name of Arthur Conan Doyle finds it nifty enough for his character Sherlock Holmes’ tool kit. Meanwhile, across the Atlantic, the fingerprint craze tickles Mark Twain too, enough for him to draft climactic twists in murder mysteries. In his 1883 book, Life on the Mississippi, Twain uses fingerprint identification as a means to catch the murderer. Not to be outdone, Doyle resorts to it in his next book, The Sign of Four, published to immediate acclaim in 1890. Set against the backdrop of the 1857 mutiny, this is the first story where evidential thumb marks find a mention from Holmes in solving a case. Strange as it may seem now, but until Doyle’s leap of faith, most criminal investigations followed the so-called Bertillon’s anthropometry system to identify suspects and offenders, which meant poring over what were known as ‘rogue galleries’, a set of photographs and primary anthropometric measurements of one’s head and limbs against each convict’s name. By 1890, the idea of using fingerprints for solving crimes has gained traction, principally as a result of endorsement by Francis Galton, a renowned statistician and also, sadly, the father of eugenics. Galton’s quest for foundational evidence for his eugenics theory gets him interested in both Herschel and Faulds. The racist gets to work. The key question he seeks to answer is whether fingerprints can also identify a person’s race. He contacts various anthropological labs and over a short period of time amasses over 8,000 sets of fingerprint samples, representing the upper and middle-class English from London, pure Welsh speakers of South Wales, Blacks from the territories of the Royal Niger Company, Jews studying in London, Basques from Cambo, Herschel’s record from India, and more. Little does Galton know that the bearers of such uncommon powers of observation were already amidst him, that he would hear the news of their breaking the fingerprint code within his lifetime, that it would take them less than a year to design a groundbreaking classification system the world would embrace instantly, and what may have left his spirits dimmed even further – that those virtuosos would not be “to the manor born”. Fate is kind to Galton. He is spared the last happenstance, for the Indian geniuses wouldn’t be acknowledged and brought out from the shadow of their English supervisor, Inspector General Edward Henry of Bengal Police, till 25 years after their astounding invention of 1897. The year is 1911. The capital of India has switched from Calcutta to Delhi, and Galton is dead. He has died in peace, knowing only of Henry and the eponymous Classification System. Would the father of eugenics have squirmed and retched had he come to hear his name taken in the same breath as those of two Bengali sub-inspectors? One can’t tell. What needs be told, and retold, though, is the story of the two Bengali sub-inspectors, for it is one that adorns not book covers but, rather, the after-pages of our history. From 1858 till the turn of the next century, Bengal underwent an unprecedented transformation. It suffered the brutal crushing of another revolt in form of the Nilbidroh, a cyclone that destroyed the coast, and three devastating famines. The story of post-mutiny Bengal is the story of its iconic Writers’ Building that stood through time and tragedy, privy to power and politics, tirelessly rolling out reams of office orders and gazette entries. It beheld one empress and eight Viceroys, and a slew of socio-economic and judicial reforms. It witnessed the re-emergence of the Brahmo Samaj and the many schools for imparting Western education in the arts and the sciences. It oversaw new lifelines in the form of the Hooghly line of the East India Railway from Calcutta to the new capital Delhi. It sensed the imminent severance of sisterhood between Brahmaputra and Padma, even as the seeds of communal politics were being sown. It saw the institutionalisation of Indian police, and educated Indian men for the first time in positions of writers, officers, and sub-inspectors trudging up and down its staircases and airy verandas. India was changing, and so was the Writers’, with the addition of new blocks, a large portico, a statue-lined parapet, exposed red bricks, and a Greco-Roman façade. And in its hallowed interiors arrived one day as the Inspector General of Bengal Police, Edward Richard Henry, an ICS officer with 18 years of service. The year was 1891. Well-read and open to new ideas, Henry, within his first year of taking charge decided to establish a department of Anthropometry in the police block of the Writers’. He had heard of Herschel’s work, and of his 1862 letter (to the government and later to Bengal’s Inspector of Jails in 1877), advocating implementation of the fingerprint signature-manual for prisoner identification and other official proceedings. He also knew that Herschel’s request was turned down in 1863 so as not to raise controversy at a time when Nilbidroh was starting to abate in the province. The practice was abandoned and then quickly forgotten once Herschel was done with his India duties. Henry now thought time had come to revive it. With an aim to introduce it within the Anthropometry department as a supplement to Bertillon’s measurements, Henry set about his search for sharp men for the new task. He wrote to the principal of Calcutta’s Presidency College to recommend prospective candidates, but with one condition – they had to be strong in mathematics. The principal knew just the man. Azizul Haque. Soon, Haque landed a job with the Bengal police as a sub-inspector. He was tasked with instituting the anthropometric system. The estranged son of a poor Muslim family of Khulna (now in Bangladesh) thus became the first head of the identification unit of Bengal Police. Born in 1872, the young Azizul was fond of only two things – numbers and food. Numbers was fine, but a penchant for food turned out to be a little problematic for the family eking out a living in turbulent Bengal. Beaten and humiliated routinely for his gluttony by the elder brother, 12-year-old Haque ran away from his village. He found himself on a Hooghly-bound train, and then as an errand boy in a well-to-do Hindu family. His benefactor allowed the young Azizul to sit through home tuition lessons with his children, in itself exceptional for a caste and prejudice-ridden society. Soon, Azizul’s remarkable gift of tackling complex mathematics with ease became the talk of the town. To his credit, the master did not let the boy’s talent wither. With his sponsorship, Haque gained formal schooling and won himself an admission in Presidency. The brave new world awaited the brave young Haque. Also joined with Haque, as the second sub-inspector in the Anthropometric Department, a young man by the name of Hem Chandra Bose. The Haque-Bose duo would soon become the chisels for Edward Henry to emboss his name in golden letters in the annals of forensic science. But the embossing wouldn’t come easy. Unknown to Henry, there were others around the world striving for the Holy Grail. It would be a fight to the finish. Ten thousand miles to the back and beyond of the Imperial capital of Calcutta, history was about to be made. On 19 June 1892, Necochea, a small town some 300 miles from Buenos Aires, Argentina, witnessed a gruesome murder of two children. The man investigating the crime, inspector Alvarez, had been taught the basics of fingerprinting by one Juan Vucetich, a Croatian émigré, and himself an admirer of Galton. While scouring the grisly crime scene, Alvarez noticed a bloody fingerprint on the doorjamb. He cut the wood out and took the fingerprint for analysis back to the police station where his suspect was cooling his heels. The prints matched. The murderer was none other than the father of the two children, Francisca Rojas. Rojas went to the gallows and Alvarez into history, as the first man to solve a murder through the use of fingerprints. But solving one crime was not enough. A system had to be devised to ensure speed and reproducibility. And this is where both Alvarez and Vucetich dropped the baton. Henry was only too glad to pick it up. Backed by the Indian wizards, Henry set about inventing a classification system that would be scalable, accurate, and easy to use. He made an exploratory visit to London in 1893, to meet Galton and gain firsthand knowledge of the potential of fingerprinting. Having dropped his interest in fingerprinting, Galton didn’t mind sharing his data. Delighted, Henry returned to India with a trunkful of Galton’s work, most of it unpublished and in draft form. Back in Calcutta, the gauntlet was thrown at Haque and Bose who, eager to impress their English superior, grabbed it with both hands, immersing themselves in the study of Galton’s data and results. Haque was quick to decipher the general patterns of loops and whorls described by Galton. Instantly attracted to the mathematical challenge that lay ahead, Haque’s frighteningly analytical mind went to work. Within a year, he had devised mathematical rules and formulae enabling segregation of the loops and the whorls into finer categories through ridge counting and ridge tracing. Using Haque’s keys, one could now pigeonhole 10-digit fingerprint forms into distinct categories, 1024 to be precise, and find a perfect match in no time. All one needed was a sheet of ordinary white paper, printer’s ink, an ink roller to take a neat finger stamp, a sharp pointer or wire for ridge counting, and a trained set of eyes with or without the aid of a magnifying lens. Bose, meanwhile, was busy tackling supplementary challenges such as comparing imperfect impressions that bore faint or few ridges and indexing marks of accidental nature. Haque also simplified the complex mathematics behind his formula into a set of handy rules. These were so simple that a trained person could easily memorise them without a key, and classify 100,000 fingerprints in one go. Fingers on each hand were assigned a standard identifying number. Starting with the right thumb, fingers on the right hand were numbered from one to five. On the left hand, starting from the thumb, they were numbered six to 10. 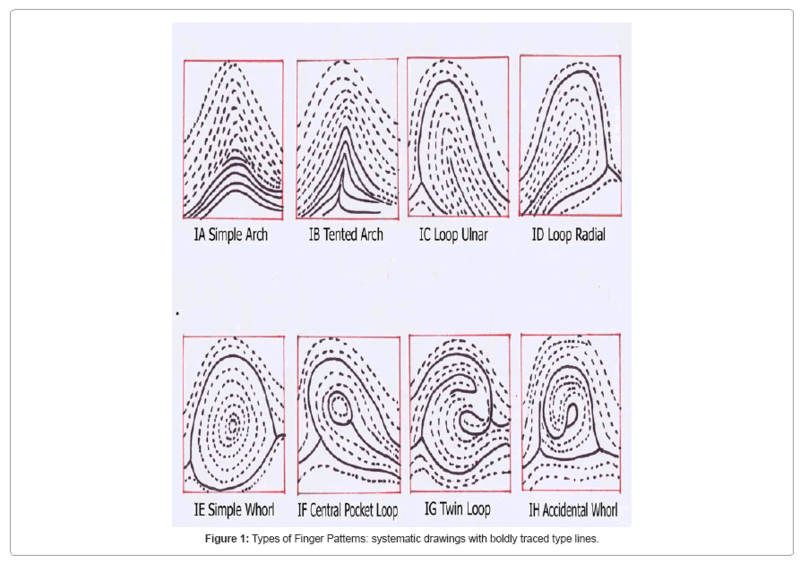 Each fingerprint was then assigned a letter or a symbol based on the eight pattern types such as a whorl, an arch, a loop, a tented arch and so on. Next, each finger was given a value. The value was zero if the finger had an arch or a loop. If, however, only a whorl was present, a non-zero value was assigned. The values for fingers numbered two, four, six, eight and 10 were totalled and one added to the sum. The values for fingers one, three, five, seven and nine were added and again one added to the final tally. The even-numbered finger total was used as the numerator and the odd-numbered finger total as the denominator, to arrive at a primary classification ratio. For example, if the fingerprint record had LWAALALWLA pattern series – where the letters L, W, and A stood for loop, whorl, and arch respectively – the classification ration would be 19:1. By 1895, Haque and Bose were sure of the superiority of their method that, for the first time, allowed remarkably accurate identification of the bearer through his fingerprints. Overjoyed, Henry confirmed this conclusion in his correspondence to Galton that year. Then, slowly, not wanting to ruffle feathers, he began to advocate to administrative circles what he called the Bengal police method of fingerprint classifications as a more effective technique for criminal identification over that of Bertillon’s. On his request, the government of India set up a special committee to evaluate the relative merit of the two methods. The evaluation bench, comprising C Strahan, Major General of the Surveyor General of India, and Alex Pedler, Principal of Presidency College, spent considerable time with Haque, Bose, and Henry at the Writers’. Their method had to be closely reviewed against Bertillon’s for affordability, rapidity, and accuracy. Haque demonstrated the method in great detail. Having learnt and tested the classification method on sample fingerprints within a day, both assessors were impressed beyond doubt. Based on their positive report, Viceroy Elgin’s office issued a resolution, dated 12 June 1897, for fingerprinting to be introduced throughout British India, as the most preferred means of criminal record classification and identification. The Haque-Bose Classification received rave reviews from all over India; but of course, it always carried the moniker ‘The Henry Classification’. Henry decided the time had come for him to attack the final summit – the mother country. At the sixty-ninth general assembly meeting of the British Association for the Advancement of Science held at Dover in September 1899, he read a paper on the technique, unassumingly titled “Classification and Uses of Fingerprints”. The talk was a hit. The paper garnered widespread acclaim and interest, so much so that Britain’s Identification of Criminals Committee picked it up for an in-depth inquiry and critique. With the dawn of the new century, arrived in Calcutta the news Henry had been hoping for. The Henry Method had received a favourable review by the Committee. Impressed, the Government of India decreed that the paper be published and distributed as a book across all Indian provinces. The Anthropometric department at the Writers’ became the first in the world to have a designated fingerprinting bureau. Embittered and enraged yet outwardly docile was how Haque and Bose took the deceit. They drank the poison. Spine grows in the back forced against the wall, but seldom when the back is brown and bears the runnels of cruelty. Growing up in colonial India in the throes of poverty, humiliation, limited means of education, and scarcity of refinement and grooming, the one element in abundance was a sense of inferiority drilled into the natives by their masters, and acutely for those who had had to work hard to earn an escape from their miserable past. The body had been primed for blows. All one needed was psychological adjustment, to rationalise injustice, to cling on to the fragility, of status, of a secure job. Bose and Haque, young men in their late twenties, barely a few years in to their first employment, took the tough call. To be sure, it was tougher for Haque than it was for Bose. A self-made man who had run away from home and revolted against the world, and had no other possessions on him but his genius and pride – Haque was despondent. Faint office murmurs began doing the rounds in the Fingerprinting Bureau carrying Haque’s vexation, like of the time when his patience was tested almost daily, having had to repeatedly explain the Haque 1024 bundle system to the Inspector General of Bengal Police, the very man who claimed to be the sole inventor of the Haque 1024 bundle system. Life, they say, is like a river and being Indian makes one understand it better. The hurt was reined in. The sudden announcement of Henry’s secondment to South Africa, in a way, helped Haque and Bose deal with the unalterable reality. The Classification system was no longer theirs. Like Henry, it was gone, away to a distant shore, beyond their grasp. Haque called it quits, realigning his focus to dutifully accept and deliver on mundane assignments that came along during his police service tenure. Bose, on the other hand, proved a harder nut to crack. He dragged himself back into fingerprint research, to try and develop a telegraphic code system so as to make it possible for international crime departments to share fingerprints information. Hurt, though, is an open wound; it festers unless treated with justice. Even as Haque and Bose carried on with their lives, the unfolding events of the next decade could not but have touched a raw nerve. Riding on acclaim, Henry – their friend and mentor Henry – secured a plum post in England. Made in charge of the Criminal Investigative Department at the Scotland Yard, the one immediate change he brought in was to establish Britain’s first fingerprinting bureau, the Metropolitan Fingerprint Bureau of the Scotland Yard. Bengal police’s fingerprint classification method had now universally replaced Bertillon’s method. It formally came to be known as the Henry classification system. What should have been the Haque-Bose system was just Henry’s, and it stayed so for a century. History written by the victors is peddled by the vanquished. At the dawn of the new millennium, in the age of PCR and DNA fingerprinting, G S Sodhi and Jasjeet Kaur, two contemporary scientists and forensic experts took it upon themselves to have Haque and Bose recognised by the international fingerprinting community. In 2009, Britain’s Fingerprint Society conceded to their plea. It acknowledged Haque and Bose as pioneers in the field by instituting an innovation award in their names. A significant step, yes, but not quite the recognition and acclaim owed to the two men who had done more than any other for fingerprinting. This becomes even more evident as one picks up the thread of their remarkable achievements at the turn of the last century. Even as new fingerprinting bureaus were sprouting all across the Western world, the Bengal bureau kept ahead of the curve on fingerprinting research. This was perhaps the only glimmer of joy in an otherwise despondent and miserable Bengal. With one swish of Lord Curzon’s sword, it had been split into East and West in 1905. Its streets resounded with protest slogans and emotional renderings of ‘Amar Sonar Bangla’ but to no avail. The misery of Hem Chandra Bose and Azizul Haque weighed little next to that of their motherland’s and they gauged it. Quietly, patiently, Bose put himself back to work in his small office at the Writers’. As the years rolled on, his research flourished, spinning out invaluable advances one after the other. The first of these was the truly revolutionary method of telegraphing fingerprints. In one single stroke, it eliminated delays and prohibitive travel costs till then taken for granted for international collaborations in crime management. Almost immediately, the Calcutta bureau implemented his invention for linking bureaus within India. In 1911, when Assam, Bihar, and Orissa were cleaved from Bengal, Haque, still smarting from Henry’s deceit, decided to leave his past behind and move out of Bengal. He took a transfer to join the Bihar Police. Meanwhile, Bose had finished detailing the telegraphic code in his book, Hints on Fingerprints with a Code for Fingerprints. A seminal work whose value even the British acknowledged, it was circulated by the Bengal government to bureaus across provinces. In the book, Bose specifically mentioned that his novel method “will be of considerable utility for the Scotland Yard”, that by then had earned the label of the most famous detective organisation in the world. Perhaps it was to do with Bose’s longing for recognition by the Yard. After all, 17 years had passed since the heartbreak, long enough for Bose to forgive and forget, and much too long for him to try his luck at imperial recognition. Sadly, though, 17 years were not long enough for the mother country to pay heed to genius originating from a colonial bureau. History repeated itself. The Yard didn’t take note, not at least till 1921 when one of its own detectives, Charles Stockley Collins, published a book on the same topic. In the preface of his book A Telegraphic Code for Fingerprint Formulae, Collins stated that he had developed the idea in 1914, just didn’t publish it. Yet again, fate had dealt a cruel blow to Bose. His book, and the availability of Indian police telegraphic code cases were neither acknowledged nor referenced by Collins. This when Bose’s book had gained popularity and acclaim, both in the police as well as the investigative crime solving community to such an extent that readers were clamouring for a second edition to be brought out. Instead, the world only remembers Superintendent Collins, as one of the greatest fingerprint experts and the inventor of the revolutionary telegraphic code. Bose was neglected, and then forgotten. Despite the telegraphic code – his, not Collins’ – being widely in use in India since 1916, its first acknowledged use is documented as one where a suspect was charged for a crime committed in England with no prior history of convictions in England; his fingerprints, when telegraphed over to the Sydney police, confirmed previous convictions in Australia. The year? 1925. Figure 9: The use of the telegraphic code by the Scotland Yard made news in January 1925, even though the Bengal police had been using it since 1916. It is difficult to think Bose wouldn’t have come to know of Collins and his code. Did being denied his due second time running not bother him? No one knows. Whatever the truth, Bose kept it to himself. He had little choice. Haque, meanwhile, was rising through the ranks over in Bihar. Those were heady days. Gandhi had become a household name. Witnessing the Satyagraha at Champaran from across the pickets left an indelible impression on Haque. The spirit of nationalism had caught up with him once again and this time around he mustered enough courage to demand suitable recognition for his pioneering work in fingerprinting and forensics. Preoccupied with the menace of Gandhi and his plucky disciples, and the 1857 mutiny still fresh in its mind, the government was only too eager to keep its Indian officers in good spirits. In 1924, Haque and Bose were conferred with the titles of Khan Bahadur and Rai Bahadur. A bitter-sweet reward, that, too, received when asked for, garnered mixed emotions, especially when it was followed by an unexpected letter from Edward Henry to Haque. Breaking the hiatus of more than 20 years, Henry congratulated Khan Bahadur Haque, wishing that a material reward in the form of a jagir had accompanied the recognition. There was no such missive for Rai Bahadur Bose. Egged on by Henry’s words of encouragement, Haque, his meagre salary and the prospect of an even more meagre pension at the back of his mind, drafted an application to the governor of Bihar and Orissa, requesting the grant of a jagir in view of his contribution to fingerprint science. The painstaking research of the National Archive documents by Sodhi and Kaur has unearthed the lengthy, torrid exchange of correspondence that constituted Haque’s application. It was an undertaking more humiliating than any Haque had had to bear previously. While Haque pursued his hope of being allocated a jagir to save his family from falling into poverty once more, Bose continued to solve further mysteries of fingerprints. He had learnt through field experience the practical challenge of his own method. It was cumbersome to transmit telegraphic prints for all of the 10 digits of a suspect. Bose tweaked Haque’s original 10-digit classification formula to come up with its next version – a single digit classification system that made telegraphic transmission much simpler, besides making it possible to decipher and match fingerprints left behind by chance while handling objects at the crime scene. It was a remarkable breakthrough. Soon, many countries took note of it including Germany’s Ministry of Interior. At the International Police Exhibition held in June 1925 at Baden in Germany, several German and European officials got a chance to be acquainted with officials of the Indian police, and through them about Bose’s work. That year, the journal International Police Safety carried a reference and praise for Bose’s technique in its September issue. He was also made an honorary member of the Police Exhibition Committee. A year later, Bose published his second seminal work, on the single-digit classification method called “Finger Print Companion”. Meanwhile, Khan Bahadur Haque’s appeal had gone through inordinate delays and multiple rounds of scrutiny. Bihar and Orissa had no piece of unclaimed land that could possibly be granted to Haque. What made matters worse was that there was no official mention of Haque in Henry’s book or his public speeches. The Director of Intelligence Bureau questioned Haque’s credibility, wondering what made Haque claim special recognition and reward after decades of delay. To settle the matter, Henry was consulted to confirm Haque’s contribution. An old man in his late seventies, he had a change of heart, declaring that in his opinion, “Haque contributed more than any other member of my staff and contributed in a conspicuous degree to bringing about the perfecting of a system of classification that has stood the test of time and has been accepted by most countries. As in most research work, results were achieved by teamwork. In addition to being indebted to Khan Azizul Haque, I was indebted to some of his colleagues but to what extent I cannot after the lapse of nearly 29 years specify more exactly.” Henry’s words buttressed Haque’s claim. Just around the time of his retirement, 1926, not a jagir but an honorarium of Rs 5,000 from the central fund came through. The supporting note by the Home Department read, “It appears from the information now received that he was Sir Edward Henry’s principal helper in perfecting the scheme and he actually himself devised the method of classification which is in universal use. He thus contributed most materially to a discovery which is of worldwide importance and has brought a great credit to the police of India.” Gratified, Haque and his wife settled down with their family of 10 in Motihari, Bihar. The Yard had missed an opportunity of spotting a phenomenal breakthrough. Collins’ successor, Henry Battley, did no better. While the Bengal bureau had already been using the single-digit method for more than a year, and successfully, Battley initiated a project to reopen Collins’ code to work towards removing its drawbacks. A book titled Single Finger Prints, published by Her Majesty’s Stationary Office in 1930, resulted from this snooty thrashing in the dark. And yet again, the third time over, this book, too, made no reference or acknowledgement of Bose’s work that had preceded the Yard’s efforts by more than two years. Lucky for Bose that his superiors back in Bengal were more sympathetic, not only of his contributions but also of his precarious finances. In 1929, taking Haque’s case as a precedent, the Bengal government and India’s Intelligence Bureau recommended Bose for an honoraria of Rs 10,000. Sadly, the government of India raised an objection, as Henry’s recommendation in the earlier case of Haque had no mention of Bose. Call it prejudice or galling behaviour, Edward Henry’s confirmation was once again solicited. He didn’t disappoint this time around, too, writing: “The Rai Bahadur has devoted the whole of his official life to perfecting the methods by which search is facilitated and his labours have contributed materially to the success achieved. He is entitled to great credit”. But times had moved on. Henry’s word was not enough. It was a superior’s personal letter, pleading immediate release of honorarium “as the Rai Bahadur is lying in a critical state and needs financial assistance very badly” that finally got the honorarium of Rs 5,000 approved for Bose. Haque died in 1935 at his Motihari home. It is not known what happened to Hem Chandra Bose after his retirement. These were the two satyanweshis, the truth seekers, who walked the streets of Calcutta in flesh and blood before Saradindu Bandopadhyay had even conceived of Byomkesh Bakshi. They were the men who left an immortal body of work on the back of which the world would enter into the digital world where trust, Aadhaar, would be defined by one’s fingerprint. That what we take as granted, the fingerprint, is today our biometric passport for personal identification, or a unique signature for personal banking, or indeed a password protection for our many devices. It works for most individuals except those born with an embryologic malformation of absent or faint fingerprints, adermatoglyphia, also called the immigration delay disease. Much has advanced in forensics, what with ridge density and even sweat being able to determine suspect’s gender, but fingerprints continue to be a vital part of any crime scene investigation. The Haque-Bose Classification – some still insist on calling it Henry’s – is very much in use for matching crime scene samples with pre-recorded prints. As for the birthplace of fingerprinting, the Central Fingerprinting Bureau of Calcutta, it is still functional. Crammed into a 400 square feet area at the headquarters of the West Bengal CID, its centenary was celebrated in 1997. What should have been the cause of national celebration ended up as a departmental affair at Kolkata’s Bhabhani Bhawan in Alipore. No president or prime minister or chief minister knew of it, leave alone grace it with his presence. There was no media coverage, no valedictions, no paeans, and no poems. The sands of time had blown over the fingerprints of two of India’s greatest heroes. Motihari, Bihar. The birthplace of Eric Arthur Blair, or George Orwell as he is known to the world. The house he was born in was converted into a museum recently. Motihari also had one other famous son. But there is no museum to remember him by, not even a memorial. He does not exist except in books. His name is Khan Bahadur Azizul Haque. William Herschel and Francis Galton had successful careers. Both are still remembered with reverence. Edward Henry’s name has been immortalised. He was also knighted in his lifetime. Henry Faulds has a memorial in his honour at Beith. Haque and Bose, on the other hand, were relegated to the back of the pecking order for a large part of their lives, their monumental efforts ignored repeatedly by those they trusted as friends; and at the fag end of their lives, they were scrutinised, questioned, and finally obliged with titles and a token amount for their contribution. Both Khan Bahadur and Rai Bahadur died in penury and oblivion. A nation that knows not how to honour its dead knows not how to honour its living. But we are also a nation that has rationalised every tragedy, every sorrow, every wrong. For was it not Ghalib who said: Qaid-e-hayat aur band-e-gham asl mein dono ek hain, phir maut se pehley aadmi gham se nijat paye kyoun? This article first appeared in swarajya on Nov 24, 2017.